The final instalment of our Best of 2016 series: the homes, cabins, residences, getaways, and social housing that wowed us. Here are the 10 best housing projects of 2016, including BIG’s twisting Grove at Grand Bay tower in Florida, and Jean Verville’s secluded FAHouse in Quebec. 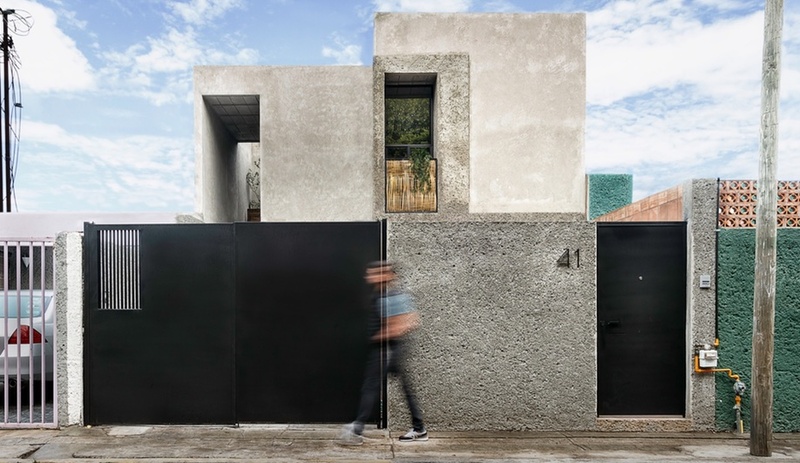 The challenges faced by Intersticial Arquitectura when it came to redeveloping a deteriorating urban dwelling in Santiago de Querétaro were plenty: a tight budget, a fractured layout, existing disrepair, and a site within an industrial context that limited design choices. Rather than battle limitations with complex workarounds, the firm sought inspiration from them. The result is a serene live-work space that is perfectly suited to, and respectful of, its environment. To create a functional and inhabitable space, the firm created a link between the ground-level studio and the apartment above. Materials – simple, cost-effective and well-suited to the home’s industrial neighbourhood – create cohesion and form the basis of the interior’s character; clay brick walls, concrete flooring, and plywood doors and shelving can be found throughout. The dried stems of locally sourced junquillo plant, noted for their strength and flexibility, were woven to form screens and divider walls. 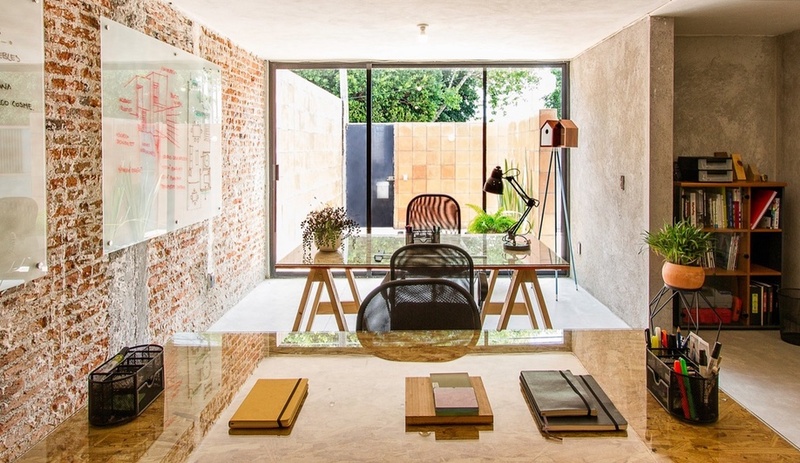 Living space needed to be maximized, which inspired Intersticial Arquitectura to develop a series of patios. Connected to the interior by way of glazed partitions, the patios bring in light and help to naturally ventilate the home. 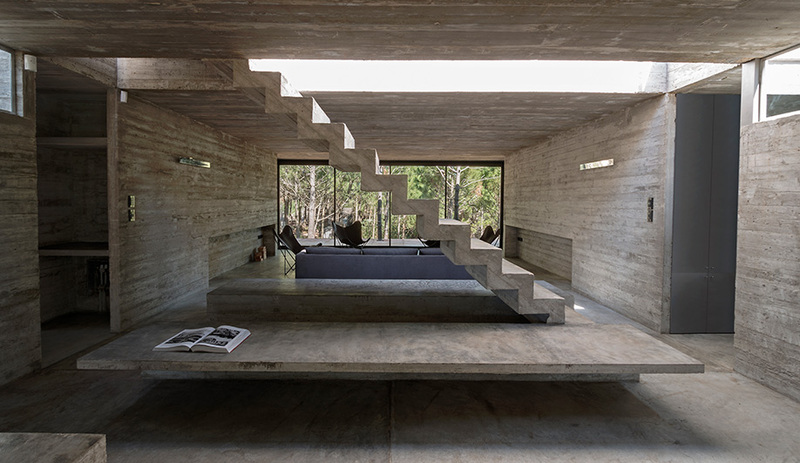 The moves are subtle and not wildly innovative, but Casa Estudio is one of the year’s best examples of the power of modesty to restore and enliven a tired space. 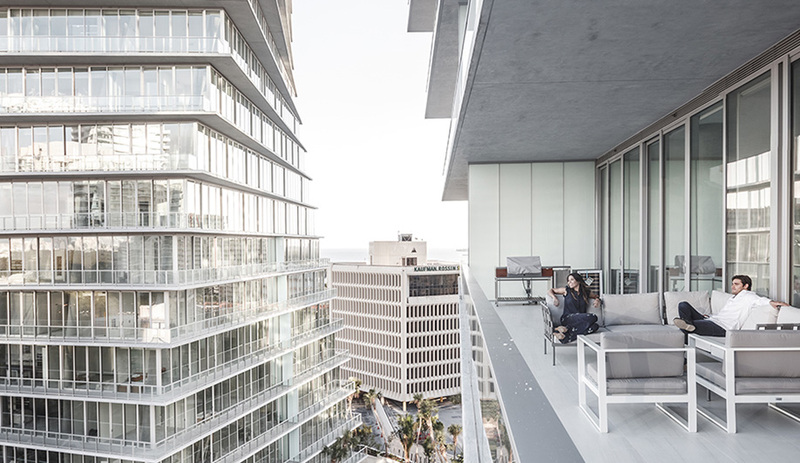 Rising out of Miami’s most historic community, Grove at Grand Bay is a set of 20-storey luxury towers that add a strikingly sculptural contribution to the cityscape, twisting their way skyward at a 38-degree rotation. The twist means each of the 98 units has an enviable view of nearby Biscayne Bay. It should come as little surprise that the provocative design is the work of Danish firm BIG, and that one reason the complex has made our Best Housing Projects of 2016 list is for its inspired construction. The buildings are an engineering marvel, with each floor plate between the third and 17th floors rotated every 90 centimetres, cantilevering up to six metres. It’s also rare to find a condo building that takes such pains to ensure equal access, equal space considerations, and equal livability from top to bottom (except, maybe the penthouse). This being Miami, the amenities include five pools, two of which are on the rooftop, and a five-star spa. A lush landscape forms the base for the towers. Designed by Raymond Jungles, the walkable, three acres of new plantings are now among the fig trees that were already growing on the grounds. 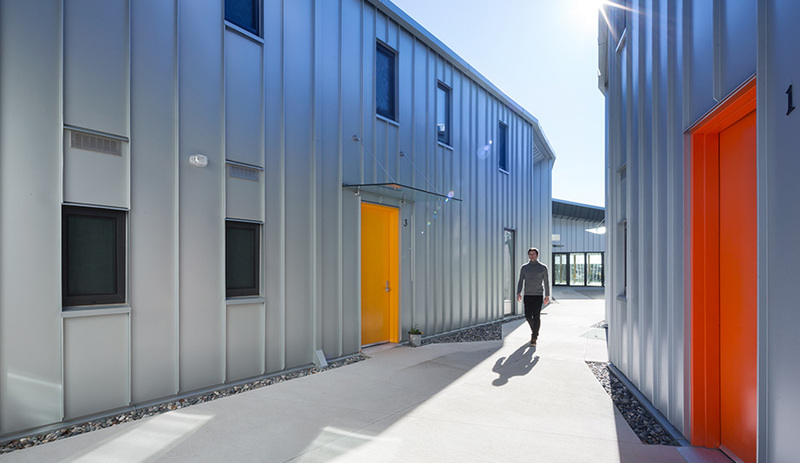 The best social housing takes a holistic approach to carefully contemplating what residents needs are, not just to survive, but to thrive – socially, physically, emotionally and economically. Chacras Project in Chacras, Ecuador, is a beautiful example of what can be attained when those necessities are taken into consideration. 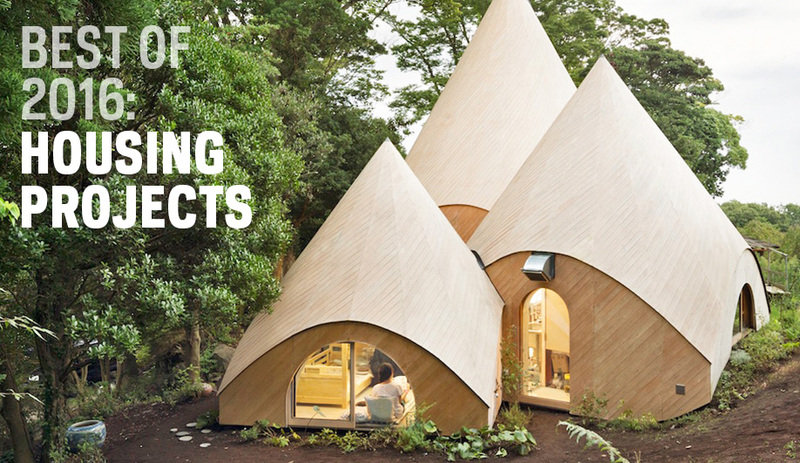 Built for a family whose home was lost to an earthquake in April, the pavilion-like residence offers shelter and opportunities for making a livelihood. The house was raised by volunteers in 10 days; its foundation constructed from concrete and brick, while corrugated zinc panels form the roof. Inside, pine-wood pallets make up the dominating material, and are used to articulate zones for sleeping, eating and living. 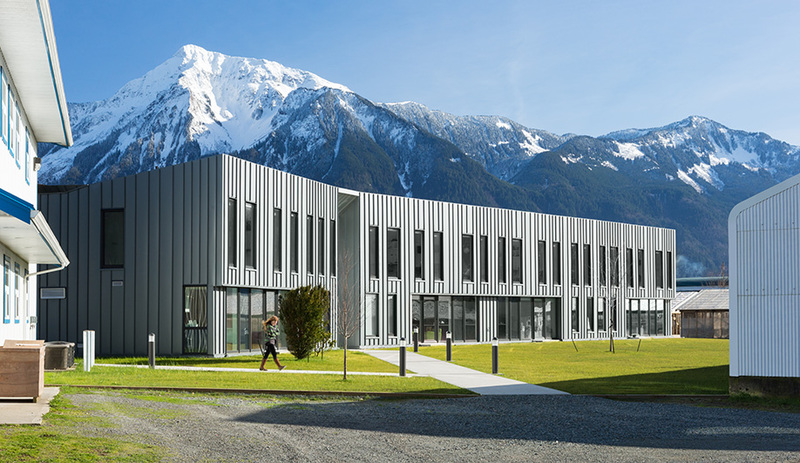 In the small community of Agassiz, about 100 kilometres east of Vancouver, the University of British Columbia’s Dairy Centre opened its doors to a new residence building, allowing students and researchers from the province, and around the world, to live on-site. 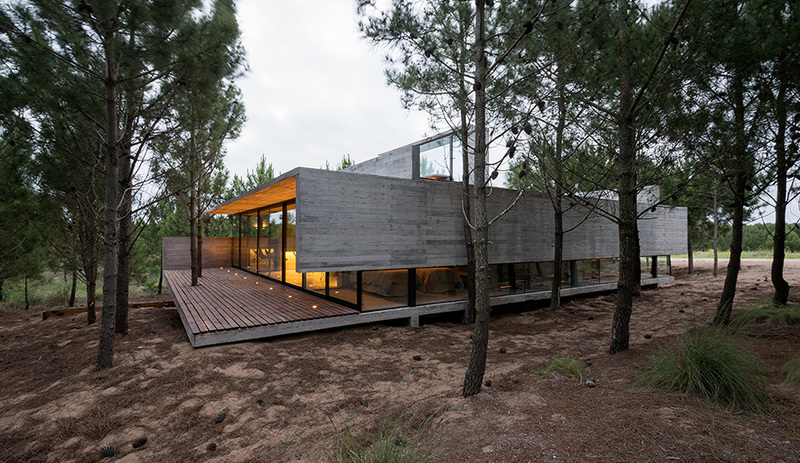 Tucked amid a forest of maritime pines, on a sand dune that juts into the Argentine Sea, Casa L4 is a hidden gem that takes full advantage of its natural surroundings. Buenos Aires architect Luciano Kruk kept as many trees intact as possible while also working with the existing uneven topography. 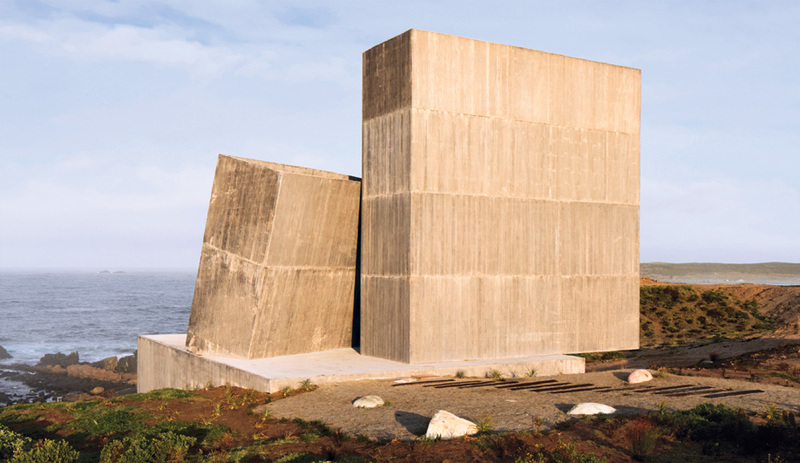 He chose to build the single-storey house in concrete, creating a harmonious dialogue between its stoney grey tones and the rocky terrain. The textured formwork walls are left exposed throughout the 183-square-metre interior, which positions a bedroom and ensuite bathroom at each corner of the house. Separating these private escapes is the main living area, which divides the social space from the kitchen and dining area with a floating concrete staircase that zigzags up to the rooftop pool deck. 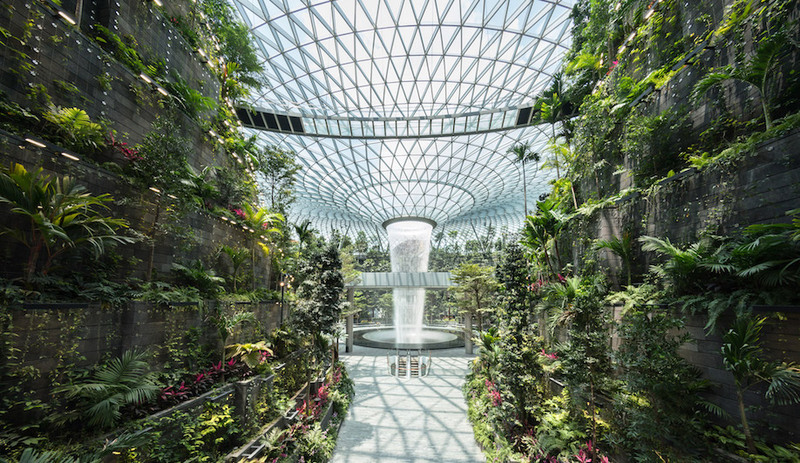 The glass entrance to roof level also draws sunlight down into the home’s core. On the outdoor upper level, the tree canopy hugs the house, blocking views to and from the adjacent road. But in the opposite direction there are sweeping views to the ocean beyond. Azure has already showered Enough House with accolades. 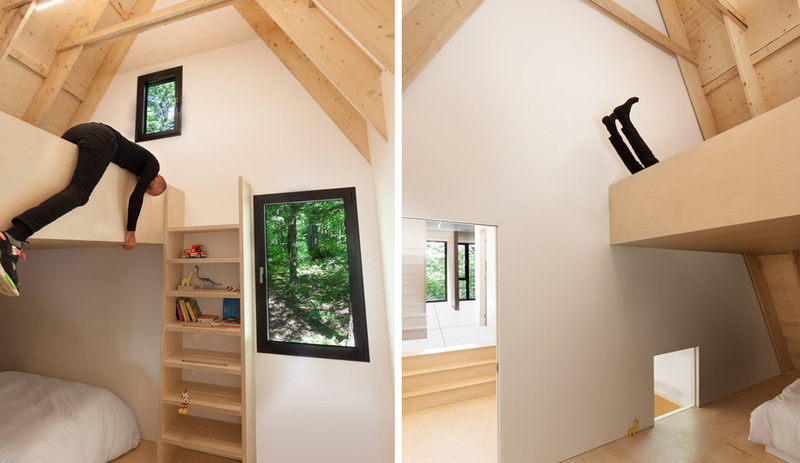 The cottage, by Nova Scotia architect Brian MacKay-Lyons, won Best Concept Prototype at this year’s AZ Awards. For decades MacKay-Lyons has erected architectural experiments on his South Shore farm, and the latest is an effort to design an attractive and efficient home that is built economically, and which could also be dropped into any type of environment, rural or urban. 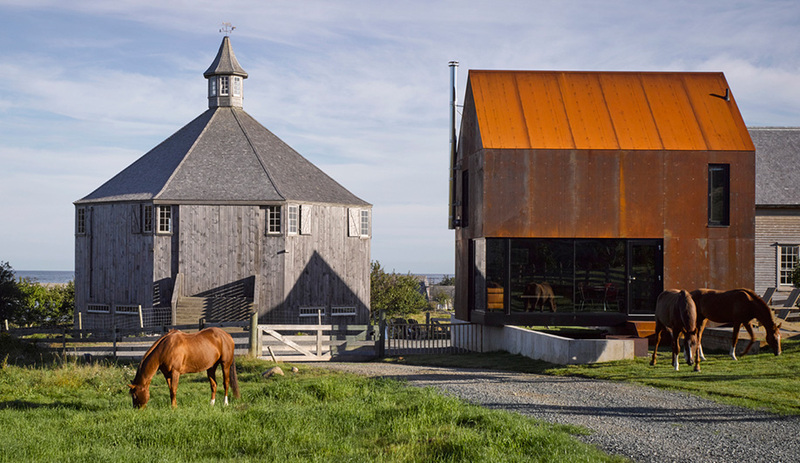 Sheathed in a floating Corten steel skin, small and large cutaways maximize on both privacy and views. The concept allows for these openings to be reconfigured, depending on where the house might be sited. Its 65-square-metre floor plan is carefully plotted to pack in a living room, full kitchen and bath, dining area, second-storey bedroom, and a loft. If a little more Enough is required, an addition has been designed to add another 28 square metres. The house is now installed and available for summer rentals. As housing markets around the world continue to climb, finding affordable alternatives is increasingly more difficult. That was the dilemma Mrs. Fan faced when she moved back to her childhood home in the Changchun Jie Hutong District of Beijing. 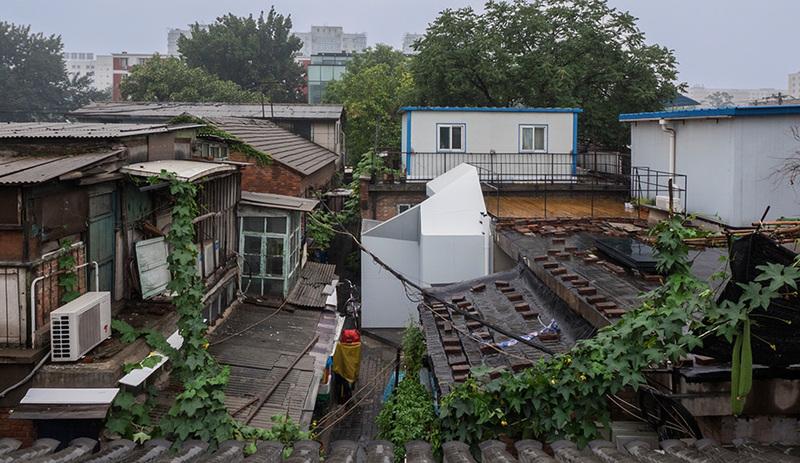 In a congested neighbourhood marked by a crumbling infrastructure, Fan’s tiny and severely outdated courtyard house was not suitable for her family. That’s where local firm People’s Architecture Office came in. 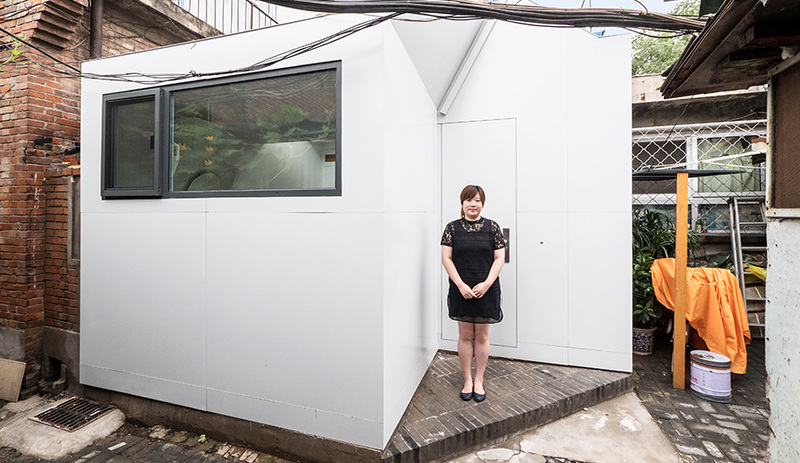 Using a system of prefabricated panels, the firm was able to double in size the cramped house. 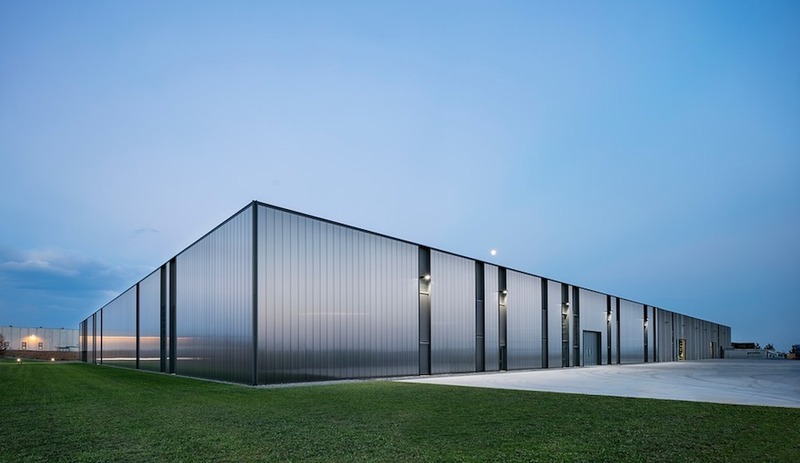 PAO’s panels replaced a portion of the old structure and extended the main living space upwards, raising the ceiling to double height to let in light from skylights on either side. This also made way for a rooftop terrace, further expanding the living space. Since there is no sewage system in the district, the expansion made room for a kitchen and an integrated off-the-grid composting toilet. It’s easy to imagine how insertions like this could be applied almost anywhere. The insulated and wired modules, which lock together with a hex key, are impressively versatile and can be cut to size and shape on site. 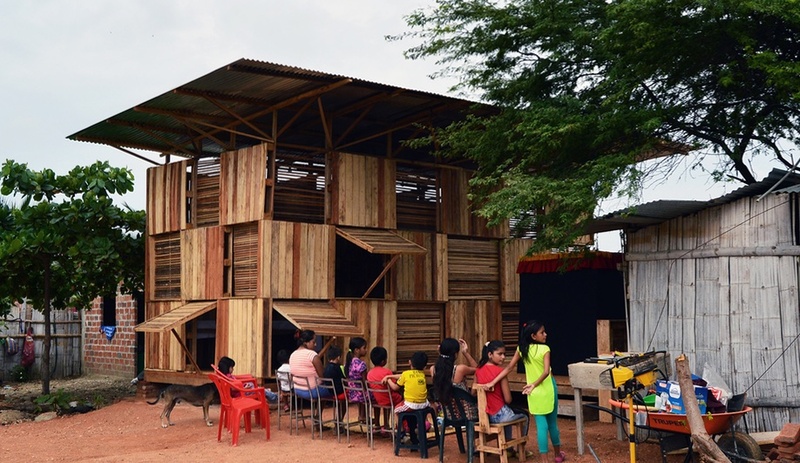 They are, quite simply, an ingenious solution when building new is not an option, either spatially or financially. Accessible (and desirable) homes for aging populations are expected to be the next big wave in building. Yet so far, the retirement home topology is in a dire state. Which is why Japanese architect Issei Suma’s Jikka is such an enchanting example of how to live magically, no matter how old. 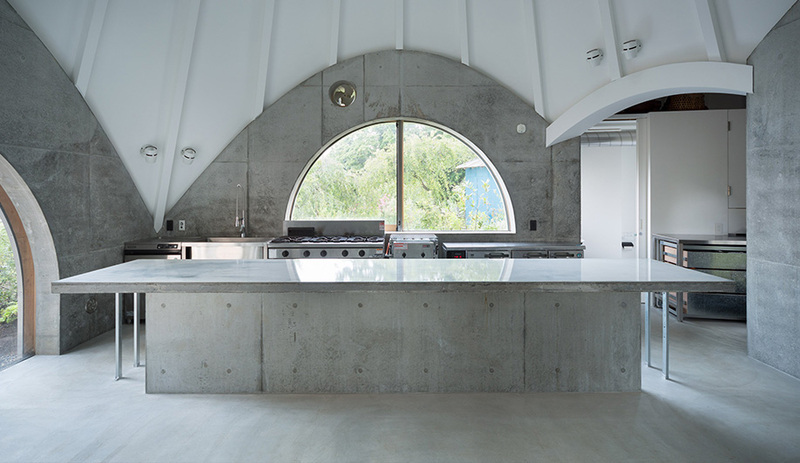 Commissioned by two female retirees – one a social worker, the other a cook – the hobbit-like complex is nestled in a mountainous area in Shizuoka Prefecture, home to Mt. Fuji. Its five wooden-clad huts merge into a 100-square-metre interior, with a dining area and spacious stainless-steel kitchen at its centre. It also features a spiral pool with a ramped entry to allow for a wheelchair to glide in and out without assistance. Jikka is actually more than a home, it’s a community hub. The centre’s big kitchen is used to prepare meals for delivery to the local town, and guest rooms are for those elderly in need of extra care. One of the least appealing aspects of retirement living is the sense that the aged have been shunted out of the mainstream. 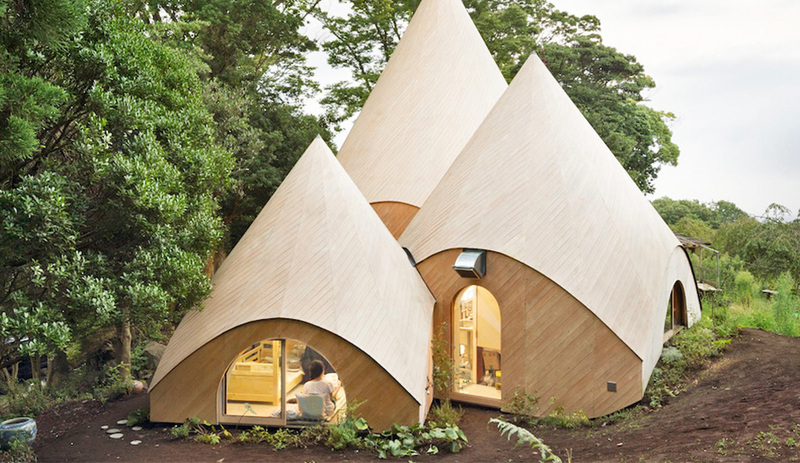 Japan has always had a great respect for the elderly (much more so than in North America) so it’s not surprising to find a retirement house like this in Japan – one that manages to be both inclusionary and beneficial to the community at large. 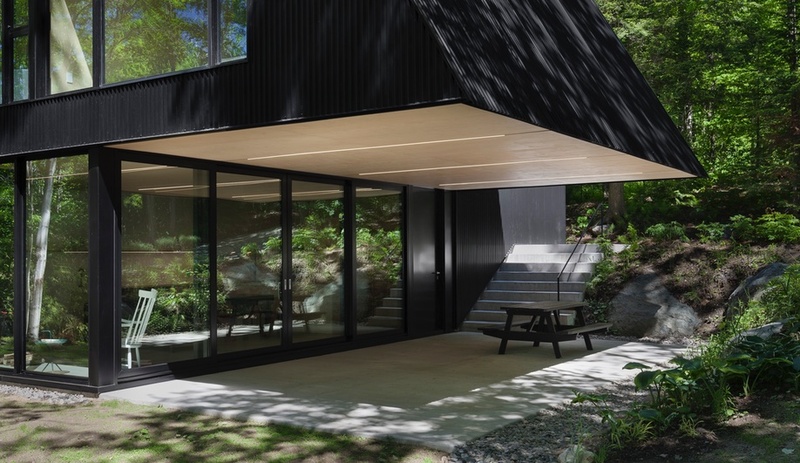 For a family cottage in Quebec’s Eastern Townships, Montreal architect Jean Verville took a chapter from a child’s idea of a house, and gave the two-storey structure two dramatically pitched rooflines that start just a few feet from the ground on one side. Their steep profiles are exaggerated just enough to make the house read as both modernist vision and fairytale. 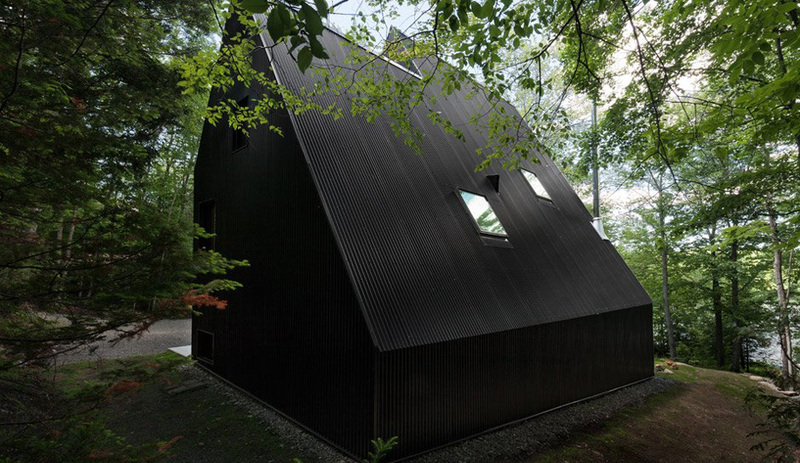 Clad in black corrugated steel, FAHouse (the FA is short for family) blends in with hemlock foliage to the point of nearly disappearing. But around one corner, the building opens up to shaded terrace and sliding glass doors that lead to an open kitchen, living and dining area. In contrast to that moody exterior, Verville wrapped the interior walls in natural Baltic plywood. Even the switch-back stairway that leads to a second level, containing the master bedroom and a children’s bedroom, is clad in raw wood. When Azure first wrote about FAHouse in July, writer Elizabeth Pagliacolo noted Verville’s reputation for bringing playfulness into many of his projects. In some photos of FAHouse, he is seen slumped over stairwells or hanging from rafters. Who can resist a modernist with the heart of a kid? 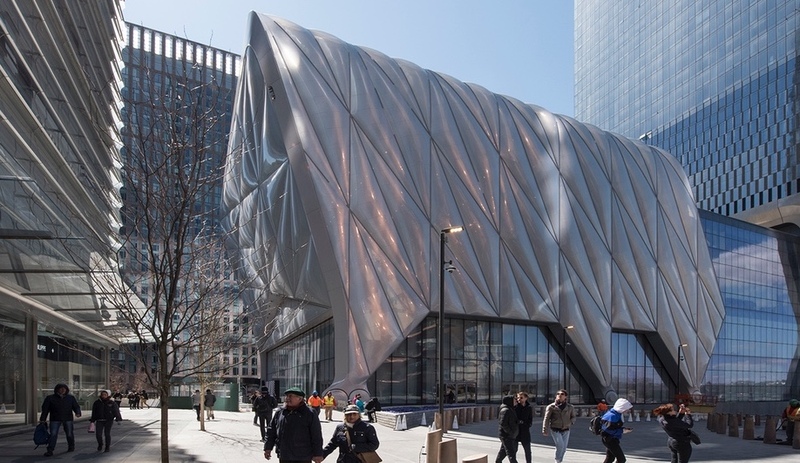 Along the Hudson River, a warped pyramid shoots out amid the boxy garages, warehouses, and new developments that make up Hell’s Kitchen. 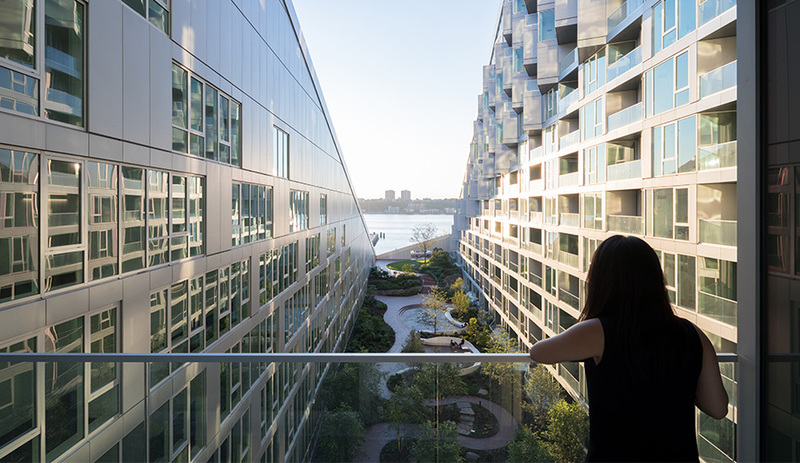 Another one of the latest projects from Bjarke Ingels Group to make our Best Housing Projects of 2016 list, Via 57 West’s sharp, curve-sloped profile appears as though, rather than wrap around a plaza, a piece of itself simply went missing. 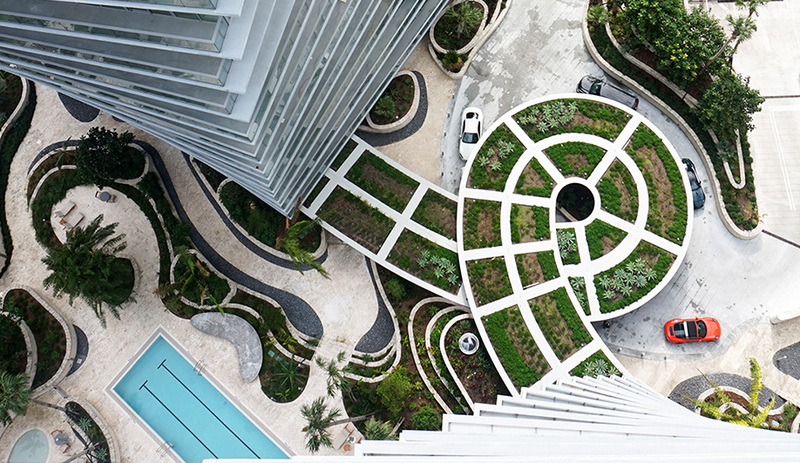 But that central courtyard is real, providing tenants with an intimate green space in the midst of urban density. Jagged balconies and windows ruffle up the surface of the inward-facing walls and flat outer sides, contrasting with the smooth mathematics of the primary facade, which is also, technically, its roof. The 709-unit project, which mixes rent-controlled units and luxury apartments, masterfully combines the European structure of an enclosed block with the capacity and scale of an American urban high-rise. (The design offers views of the river even to those on the opposite side.) 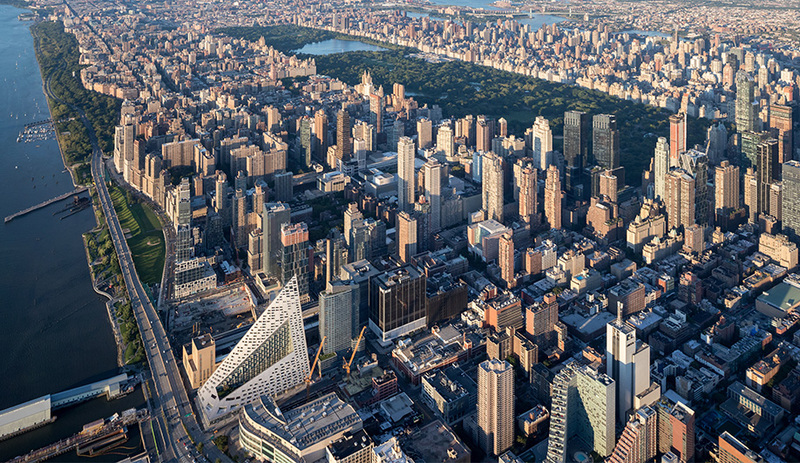 In the midst of so many nondescript residential towers, the sail-like Via 57 West is not only a deft manipulation of form and a singular feat of engineering – it is also very human.